Five Institute of Buddhist Studies’ students were presented with their Masters Degree at Commencement ceremonies on Friday, May 19, 2016 in Berkeley, CA. Rev. Dr. David Matsumoto, Provost and Vice President, Academic Affairs, IBS chaired the event. Bishop Kodo Umezu, President of IBS, and Trustee ministers conducted the opening service. President Umezu and Dr. Scott A. Mitchell, Dean, IBS gave opening remarks. Rev. Dr. Seigen H. Yamaoka, Vice President, Development made the 2017 IBS President’s Award introduction of Mr. Hiroji Kariya. Mr. Kariya is a long-time supporter of IBS, who envisioned the importance of a graduate school and supported its growth. As Chair of the Buddhist Churches of America Campaign for Buddhism in America, Mr. Kariya raised funds for professorial chairs and scholarships. He became an IBS Board of Trustee member in 1983. In 1997, he was elected to be the Chair of the IBS Board of Trustee and guided IBS to explore options for IBS to become what it is today. He served until 2008. He supported the IBS by giving of his time and financial resources throughout the years and to the present. Bishop Umezu presented the award with a deep expression of gratitude. Ms. Chenxing Han, IBS graduate class of 2014, gave the commencement address. Her title was “Be the Refuge: Reflections on Karma and Gratitude, Suffering and Spiritual Friendship.” She offered stories from her experiences as a hospital chaplain and as a visitor at Dharma Drum, a Buddhist college in Taiwan affiliated with IBS. Weaving these stories with insights drawn from the graduating class’s MA theses, she wised the graduates all the best for their journey ahead. Mr. Richard Endo, Chairperson, IBS Board of Trustees, and Dr. Mitchell made conferral of graduate degrees and certificates. Rev. Daigan Vincent Gather: Thesis: Healing in oppression: Contributions from Buddhist Teachings and Communities. Committee: Rev. Daijaku Judith Kinst, Ph.D. and Dr. Mitchell. Meg Doshin Gawler: Voices of Early Buddhist Nuns: A Dharmalogical Approach to the Therigatha. Committee: Rev. Richard K. Payne, Ph.D., Gil Fronsdal, Ph.D., and Jan Nattier, Ph.D.
Jamie Kimmel: Thesis: Buddhist Hospital Chaplaincy at the end of life: U.S. Healthcare and Challenge of Interdependence. Committee: Dr. Kinst and Dr. Mitchell. Nicole M. MacArgle: Thesis: Foundation for the Preservation of the Mahayana Tradition: A Contemporary Organization for Transmitting the Dharma. Committee: Dr. Payne and Dr. Mitchell. Dawn Patricia Neal: Thesis: Discord and its Alternatives in the Atthakavagga of the Pali Canon. Committee: Dr. Payne, Dr. Fronsdal, and Dr. Nattier. 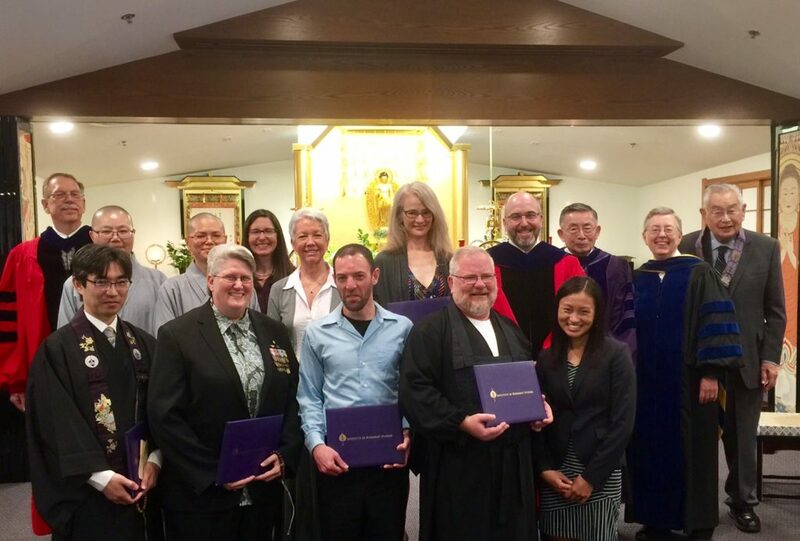 Buddhist Chaplain Certificates were presented to Gather, Kimmel, and Neal. Advisor: Dr. Kinst. Kyoshi Certificate was presented to Maribeth “Smitty” Smith. Advisor: Dr. Matsumoto. Soto Zen Studies Certificates were presented to Gather and Kimmel. Advisor: Dr. Kinst. Theravada Buddhist Studies Certificates were presented to Gawler and Neal. Advisor: Dr. Payne. The Ryukoku University and IBS Exchange Program Certificate for one-year study at IBS was presented to Masato Yanagida. Advisor: Dr. Matsumoto. The Dharmadrum Institute of Liberal Arts University and IBS Exchange Program Certificates for one-year study at IBs were presented to Tian Hau, Shi and Charlene Chang. Advisor: Dr. Mitchell.